The EzyDog Summit Backpack is a dog pack that incorporates our award-winning Chest Plate Harness, meaning that the backpack will form to your dog's chest for a secure and comfortable fit. So now you can go anywhere and your dog can hold everything! The Summit Backpack is made from a super-tough RipStop fabric with a breathable mesh on the inside for comfort against your dog. There are two roomy compartments on either side, all with zips that are fully waterproof and fitted with a reflective trim for night time walking. As well as incorporating our EVA chest plate support, the Summit Backpack has a convenient grab handle on the top of the spine for when you need control over your dog. On the back of the handle, there is also a D-Ring for accessories and a 'Leash Caddy' to hold your dog lead when your dog is allowed to roam free. For when you do want to attach a leash, you can do so via the metal D-ring. For best fit measure the girth and length of the dog. If the measurement is close to the end of the size range, go up to the larger size. Wish I found this product sooner! "My extremely energetic dog was also hesitant at first however soon adjusted to it (after being bribed with treats!). It has also had a calming effect on her and she now walks next to me instead of dragging me along. I make sure both sides are balanced with only minimal items so as not to wear her out. Thank you Ezydog!!!!!" "Good size backpack, although as my dog (kelpie x) was between sizes the next size up might have been better for her especially as she is still growing. She isn't a fan of putting it on and was acting awkwardly when we first put it on her but we distracted her with treats and toys and she walks around fine with it now. As she has so much energy it is a good way to exercise her with the backpack. Only thing I find is that when she puts her head down to smell something the bag creeps up along in her head and has slid off once. So I have to keep tugging on the leash if she is sniffing something to prevent this, maybe the backpack is too small? But overall it is a great product and made with high quality products. 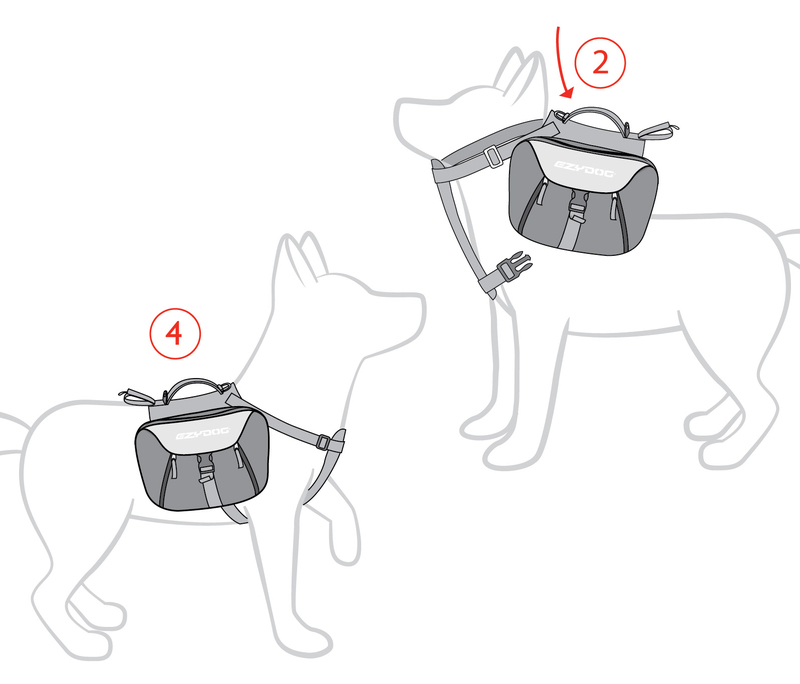 I work in the outdoor gear industry and it's good to see so much attention to detail for a dog backpack. " "This was suggested by our dog trainer who said it will have our 7 month old Labrador x kelpie thinking she has a job to do when the backpack is on her and therefore calm her down as she is a working dog. We put 300ml of water each side for a little bit of weight. All I can say is wow....it works. She is a different dog the second it goes on. She walks without pulling and will sit and wait when told. Love it! Highly recommend."